Almorexant (INN, codenamed ACT-078573) is an orexin antagonist, functioning as a competitive receptor antagonist of the OX1 and OX2 orexin receptors, which was being developed by the pharmaceutical companies Actelion and GSK for the treatment of insomnia. Development of the drug was abandoned in January 2011. Originally developed by Actelion, from 2007 almorexant was being reported as a potential blockbuster drug, as its novel mechanism of action (orexin receptor antagonism) was thought to produce better quality sleep and fewer side effects than the traditionalbenzodiazepine and z drugs which dominated the multibillion-dollar insomnia medication market. In 2008, pharmaceutical giant GlaxoSmithKline bought the development and marketing rights for almorexant from Actelion for an initial payment of $147 million. The deal was worth a potential $3.2billion if the drug were to successfully complete clinical development and obtain FDA approval. 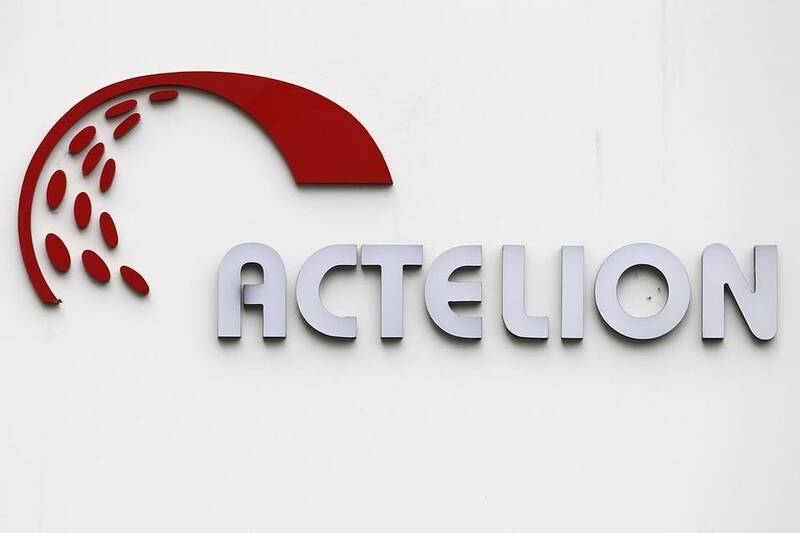 GSK and Actelion continued to develop the drug together, and completed a Phase IIIclinical trial in November 2009. 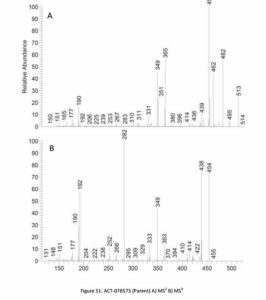 An enantioselective synthesis of almorexant, a potent antagonist of human orexin receptors, is presented. The chiral tetrahydroisoquinoline core structure was prepared via iridium-catalysed asymmetric intramolecular allylic amidation. Further key catalytic steps of the synthesis include an oxidative Heck reaction at room temperature and a hydrazine-mediated organocatalysedreduction. To the organic phase of step 11 is added 1 equivalent aqueous hydrochloric acid and then the water removed by azeotropic distillation in vacuo. The precipitate is dissolved by addition of 2-propanol at 75 0C. Concentration of the solution leads to crystallisation and the suspension is then cooled to RT. To ensure complete crystallisation, the suspension is aged at RT, then filtered and washed with a MIBK-2-propanol mixture. The product is dried in vacuo at 50 0C. 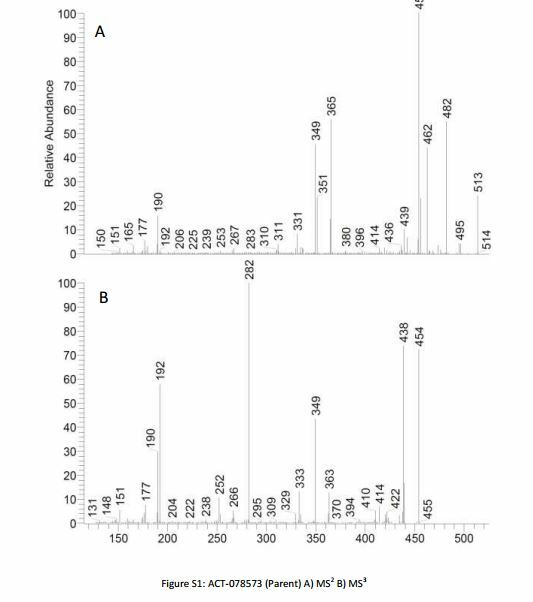 Several methods are presented for the enantioselective synthesis of the tetrahydroisoquinoline core of almorexant (ACT-078573A), a dual orexin receptor antagonist. 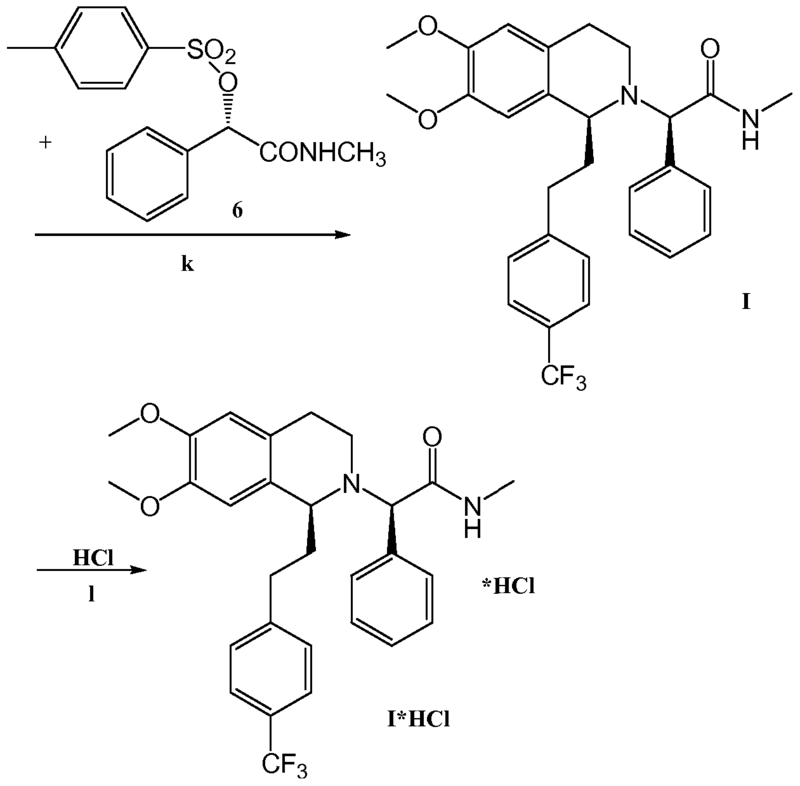 Initial clinical supplies were secured by the Noyori Ru-catalyzed asymmetric transfer hydrogenation (Ru-Noyori ATH) of the dihydroisoquinoline precursor. Both the yield and enantioselectivity eroded upon scale-up. A broad screening exercise identified TaniaPhos as ligand for the iridium-catalyzed asymmetric hydrogenation with a dedicated catalyst pretreatment protocol, culminating in the manufacture of more than 6 t of the acetate salt of the tetrahydroisoquinoline. The major cost contributor was TaniaPhos. By switching the dihydroisoquinoline substrate of the Ru-Noyori ATH to its methanesulfonate salt, the ATH was later successfully reduced to practice, delivering several hundreds of kilograms of the tetrahydroisoquinoline, thereby reducing the catalyst cost contribution significantly. The two methods are compared with regard to green and efficiency metrics. Catalytic Asymmetric Reduction of a 3,4-Dihydroisoquinoline for the Large-Scale Production of Almorexant: Hydrogenation or Transfer Hydrogenation? Almorexant in Adult Subjects With Chronic Primary Insomnia (RESTORA 1). ClinicalTrials.gov (February 3, 2010). Retrieved on May 6, 2010.